I am building a tool that will be used by call center agents. It is to help them support products on behalf of the customers who call up. 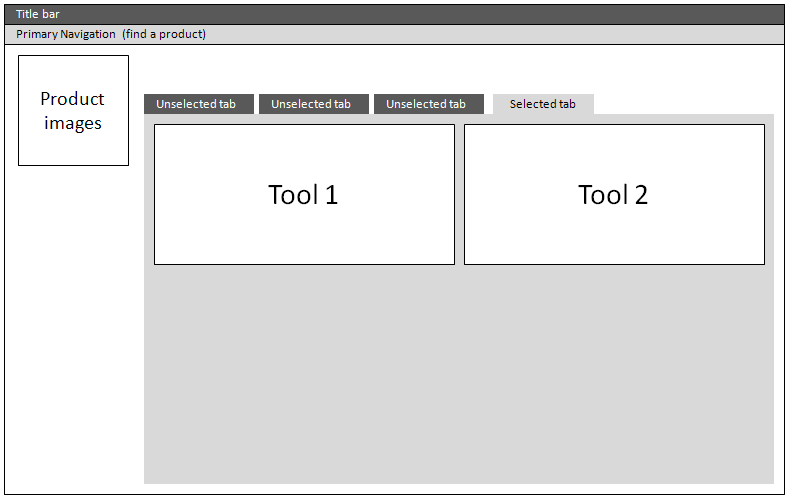 It acts as a portal to many different types of product information - below is a simplified wireframe. I have used a tab and search model - this was as the result of usability testing against a couple of different prototypes. In this particular view, the agent is viewing tools (think of these as portlets, or widgets) for a particular product (for example, a remote diagnostic tool). Effectively the agent is on the third level navigation (Home > Product Page > Tools Tab). So far I have used contrast to highlight the different levels (Product Page, Tabs, Tools) but this is based on no training or theory. I want to make sure it is clear for the user where different parts of the page begin and end as well as clear which are related to the different areas of navigation, whilst making the page easy on the eye and readable. For the purpose of this question we can ignore my company branding and colors - I would rather start with usability and then retrofit the branding into that. In fact, If I could find the right model in grayscale, that would be an ideal template. I don’t know how much help this is, but I’ll re-cast your question into something more specific. As you intuit, you want high color contrast between unrelated things, and low color contrast among closely related things. So your question becomes, how do you determine the perceived degree of color contrast between any colors? The International Commission on Illumination (CIE) long ago established equations for calculating color contrast of illuminated displays, and these equations are still largely correct for modern displays. The procedure is to convert your RGB color values to CIE Luv color space coordinates, which specify the perceived brightness (L), hue (flat angle from L axis), and saturation (distance from L axis). The degree of perceived color contrast between two colors is equal to the Euclidean distance between the two sets of Luv coordinates. Convert u’ and v’ into u and v coordinates. As a rule of thumb, for indoor use of consumer displays, a color difference of 100 is a whole lot and 20 is a very little. There is a vast range of brightness, hue, and saturation differences that achieve the same color difference. The good news is this leaves you lots of latitude for choosing your exact colors, so you can achieve other user experience goals. The bad news is this leaves you lots of latitude for choosing your colors, so you’re pretty much on your own. I’ve more on color use, with examples and spreadsheets at Breaking the Color Code. Bruce Lindbloom provides on-line calculators and more on color theory. Spatial Position. User will tend to assume information from the upper left to the lower right are ordered from general to specific. Content close together and separated from other content by white space will be seen as similar. Indented content is “under” outdented content. Line. If there isn’t space for white space, lines and boxes may be used to show separation and nesting. Size. Bigger things, especially headers in bigger font, indicate higher levels in a hierarchy. Frankly, your current use of these elements in your wireframe looks sufficient to me –even in its current grayscale form. Using color to further distinguish the levels may be over-doing it, resulting in a cluttered-looking design. Why do you think you need color contrast to distinguish the hierarchy? Have you tested this design? Exactly what problems are you seeing? Maybe color isn’t the solution to your problem. Maybe you should use color for something else. Sorry, impossible. You are actually asking for an introductory course to graphics design/visual communication. Given that this normally amounts to at least one year of most intensive training, this simply cannot be done within this context, I fear. To solve your problem well, you would require practically trained, applicable knowledge of Gestalt theory, colour theory (regarding both physiological perception and cultural connotations/semantics), visual composition and some more. Alongside with the refined visual sensibility that comes only with practice. See for starters e. g.
Wong, W.: Principles of Form and Design. Lidwell, W./Holden K./Butler, J.: Universal Principles of Design. Schoen, D.: The Reflective Practitioner. BTW: Colours heavily influence each other in respect to how they are actually perceived. You would need at least some of the concrete content for your wireframe boxes to make a somewhat informed guess about what colours might work well enough. You cannot make a good decision on the given level of abstraction. Pick out a color palette of mostly neutrals along with a handful of emphasis colors. Use the emphasis colors sparingly. Pick up any of Tufte's books. While not directly aimed at UI design, much of what he talks about is applicable to UIs (namely his justified hatred of 'chart junk'. Err on the side of fewer colors rather than more. work with your users on what they feel are the key elements. Do some sorting exercises with them to get a ballpark idea of what their primary needs are. check out Adobe Kuler for color combination inspiration. Not the answer you're looking for? Browse other questions tagged layout color tabs color-combination or ask your own question. Need to learn the right way to use fonts colors on my site? What is the value of accent colors with regards to UX? How can I show 2 different products, see both of them but interact just with one first and THEN switch to another one? Cross reference between tabs, a bad practice?